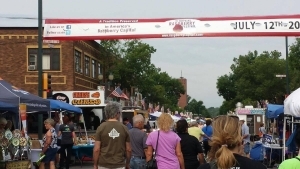 Marketplace Craft Fair – Hopkins Raspberry Festival! The entire community of Hopkins turns out on Mainstreet for Family Day to enjoy food, music and dozens of vendors displaying their crafts. There are family oriented activities available in Central Park. This event is held rain or shine. Sites can be setup beginning at 6 a.m. All vehicles and extra equipment must be removed from the site by 8:30 a.m. Vehicles and extra equipment may not re-enter the site until after 4:30 p.m. Vendor parking is available north of Mainstreet. Please park at least two full city blocks away from the site in order to give ample access to patrons. The Hopkins Raspberry Festival is using Eventbrite to allow vendors to select their own location upon registration and payment, much like a concert or theatre ticket. We may need to move you from your selected spot. If so, we will notify you. Enter the number of booths you need and select the green “Veiw On Map” box. Select the orange “Got It” box. The street is displayed: top line of dots is the North side of the street, bottom line of dots is the South side, scrolling right is East and scrolling left is West. Eventbrite automatically selects the most central location. You may deselect this location and choose another location by clicking on the highlighted dot. Once you make your choose your location, select checkout. Complete the buyer, payment, billing and your booth registration information. Select the green “Pay Now” box. The marketplace coordinator will also receive an email confirming your registration.